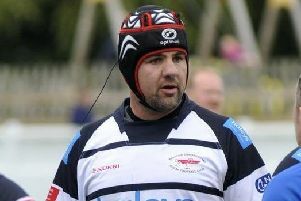 Preston Grasshoppers travelled to Brantingham Park looking to extend their run of six unbeaten matches. Hull Ionians, top of the league and set for promotion to the third tier, were always going to be difficult to beat on home turf, especially when they had a point to prove after their sound defeat at Lightfoot Green in December. Ionians had the visitors penned inside their own half for most of the first period. It was 10 minutes before play moved across the halfway line and by that time Hoppers were 3-0 down. Preston had scant possession and what little they did manage to gain was too often lost through handling errors and knock-ons. Ionians were quick to recycle the ball and whilst the Preston defence was solid as usual, with less than 10 minutes of the half to play, the Hull side scored their first of three tries and the teams left the field with the score at 10-0. The second half continued in much the same vein, with Ionians running the ball at every opportunity and Hoppers scrapping for possession. Two tries in three minutes put the hosts into a 22-point lead and with just a quarter of the match remaining and the travelling fans were facing a beating to nil. Hoppers began to get some possession and a hack and chase by Tyler Spence rewarded them with a try. Ten minutes later, after a series of penalties took them to the Hull five-metre line, Matt Lamprey broke from a lineout to score the second try and Tom Davidson converted. A succession of scrums led to a Hoppers penalty which, with the clock in the red, Davidson slotted from 30 metres to make the final score 22-15 and give Hoppers the losing bonus point. Coach Paul Arnold had no complaints about the result. “The best team won,” he said. “They capitalised on our mistakes and played good rugby to get to 22-0. “I am really proud of our lads, they are hardworking, honest and will never give up.